Yesterday i shared Produre and Story of Sai Vrat in Hindi. Many devotees requested me to translate the procedure, rules and story of Sai Baba Vrat in English as Hindi is not reachable widely and so with Sai Baba's grace I have taken up the task to translate it in English. 1. Any woman, man or child can do this vrat. 2. This vrat can be done by any person without any difference of caste and creed. 3. This is a very miraculous vrat. Desired fruits are obtained by doing it for 9 Thursdays according to the rules. 4. This vrat can be started from any Thursday by taking Sai Baba's name. One should pray to Sai Baba with complete devotion for the fulfillment of the desire for which the Vrat is done. 5. Sai Baba should be worshiped in the morning or in evening. Sai Baba's photograph should be placed on a yellow cloth. Clean the photograph with clear water. Tilak of Chandan (sandalwood) and Kumkum should be applied to the photograph of Sai Baba. Yellow coloured flowers or garland should be offered to Sai Baba, incense sticks and lamp should be lighted and then the main story of the vrat must be read. Sai Baba's name should be remembered and then prasad should be distributed (prasad may consist of a some sweet or fruits). 6. This vrat can be done by eating only fruits ( it may also be done by consuming milk, tea, sweet, etc) or it may also be done by having lunch or dinner. But it should be remembered that the vrat should not be done by not eating anything. 7. If possible one should go to Sai Baba temple and if it is not possible then Sai Baba should be worshiped at home only with complete devotion. 8. This vrat can be continued even if one is out of his/her own town. 9. During this vrat if women are going through menses or if by any reason one Thursday is missed, then that Thursday should not be taken into consideration for 9 Thursdays. Another Thursday should be taken into consideration and then concluding ceremony should be perfomed. 2. To increase the importance of Sai Baba and this vrat 5, 11 and 21 (as per economic condition) Sai Baba Vrat Books should be distributed among family and friends. In this way the vrat is concluded. 3. In the concluding ceremony, by distributing the Sai Baba Vrat Books increase Mahima of Sai Baba and we get His blessings. 4. On the 9th Thursday the books, which are to be given to our family members and friends, should be kept in pooja and then it should be distributed so that others and ours desire are fulfilled. Sai Baba devotees have a strong belief that anyone who does this vrat according to the above procedure and concludes it in the same manner as stated here, Sai Baba fulfills all their desires. A woman named Kokila lived in a city with her husband Maheshbhai. Both of them had love for each other. But Maheshbhai’s nature was quarrelsome. He did not have sense of speaking. Neighbours were fed of Maheshbhai’s such nature, but Kokila was religious woman. She had immense faith in God and she suffered everything without uttering a single word. Gradually her husband’s business declined and the earnings were also negligible. Now Maheshbhai did not go anywhere and stayed back at home. Moreover he was drawn to wrong path. Now his quarrelsome nature increased two fold. It was afternoon time. An old man came and stood in front of the house of Kokila. He had a strange glow on his face. He demanded dal-chaval (lentil-rice). Kokila gave to the old man what he demanded and folded her hands before him. The old man said May Sai bless you with happiness. Kokila said there is no happiness in my fate and narrated everything about her unhappy life to the old man. The old man explained the Vrat for 9 Thursdays. The vrat can be done by eating fruits or by taking lunch or dinner. If possible go to Sai Temple or otherwise worship Sai Baba at home for 9 Thursdays, observe fast and donate food to the hungry people and distribute 5, 11 and 21 Sai Vrat Books according to your economic condition. If you increase the importance of this Sai Vrat, Sai Baba will fulfill all your desires. But you should have deep faith in Sai Baba and have patience in your mind. If anybody does this Vrat and duly performs its concluding ceremony, Sai Baba fulfills his/her desires. - This vrat can be done by eating fruits or by taking lunch or dinner. - If possible go to Sai Baba temple for all 9 Thursdays. - Any woman, man or child can do this vrat. Worship of Sai Baba photograph should be done for 9 Thursday. - Offer flowers, light incense sticks and lamp, chant Arti and remember Sai Baba’s name and distribute prasad. - On 9th Thursday feed poor people. - On 9th Thursday distribute Sai Baba Vrat Books among family members and friends. After few days Kokila received a letter from her brother-in-law’s wife that her children does Sai Vrat and have started studying hard. She herself did Sai Baba Vrat and distributed the books in her husband’s office. She added that due to Sai Baba Vrat her friend’s daughter’s marriage was fixed in a very nice family. Moreover her neighbour’s ornament box was lost somewhere. As a result of Sai Baba Vrat someone came and returned the box after two months. In this way such miracles happened. Now Kokila came to know that Sai Baba is really very great. 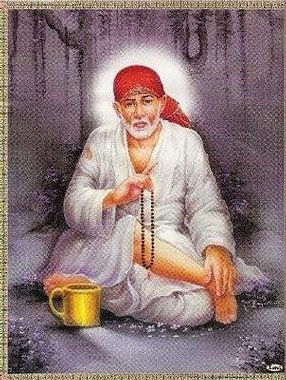 O Sai Baba please shower Your blessings on us as You have showered on others. Disclaimer: Shirdi Sai Baba had never laid emphasis on fasting. A Devotee of Baba has started this vrat initially and the vrat has fulfilled many wishes (including mine too). So its upto the readers discretion to observe this vrat or not. Thanks for the wonderful service being renderdered by you. Thanks a lot..it's really good.. Anonymous, Does any one know can this happend to. 5 people with prasad and evern smoll photoes of sai baba. rinakhatri@hotmail. Om sai ram Please baba help me i need your help. Thanks a lot Srujana . SB: I had the same experience as anonymous. I see failures before the end of my vrat and it is hard to continue after that. I have utmost faith and devotion before I do. I almost feel I am not welcomed and that is why I dont get fruitful results. I would like to know if anyone else feels this way also, if yes, how do we make it successful? Hetal Ji, I have completed Sai Nav Guruvar Vrat yesterday and distributed books. Is it is mandatory that the people who receive my books should also perform the vrat? Many of them who took the books (from me) questioned me about this. I answered them that "No, it is not mandatory". Was I right? Please reply me. I have performed this vrat previously and i got fruitful results from it. It would not be sometimes what you wished for but it could be what is best for you. Baba knows what to give, if he did not fulfill the wish it means that it was not good for you. Baba will never leave his children in harms way. Keep faith on him and work for it. can we eat noodles for dinner during 9 days vrat time? Hi Hetal, according to the Sai Vrat katha book I have been using, I am suppose to worship a sai sidha beesa yantra (which i have access to easily) with sai photo on the day of pooja. would it be alright if I use the same sai siddha beesa yantra everytime I start a new vrat. I am onto my 3rd, but using a new yantra everytime. Kindly let me know if the same would do for more vrats or if I have to buy a new every time. Thanks. My grandmother passed away this year only may 2nd 2016. I'm not married. Can I do this vrat? From which time of Thursday it begins. I do vrat from midnight 12 Thursday to next midnight 12? Is it fine? what is the evening time of worship on thursday?? i am doing Nav guruvar vrat. This thursday unknowingly i ate gods prasadam sweet pongal(Pongal= Mixture of Baked rice, jaggry,lentil, Cashew) 2 spoon in the afternoon in my office pooja. whether i should consider this thursday in count or not. Please reply. Do we have to follow fasting or single meal on every day till we reach 9th Thursday or every 9 Thursdays ? During vrta accidently my hand scratched on wood and little blood came out,I don't know what was wrong with me,but it accidently happen to me,is this bad omen,whether my desire fulfil by baba?whether baba accept my vrta ,pls help me ,and also tell me what should I have to do?